Sven Delblanc (1931-1992) was a well-regarded Swedish author who, according to the sources I've seen, often used fantastic themes in his fiction. Homunculus: A Magic Tale (1965) was a product of its time, a lampoon of Soviet and American military fanaticism during the Cold War. The object of their military/industrial interests is Sebastian, an unpleasant and unemployed chemist who, having discovered the elusive "Essence", creates a homunculus (literally, "little man") named Bechos in his bathtub. 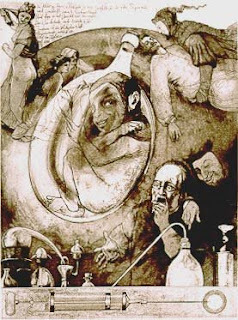 Now, the homunculus is an interesting concept in alchemical and scientific tradition: the famed Golem of Prague was a kind of man-made man (but more monstrous than a true homunculus), and renaissance alchemists/charlatans could proudly display their little humanoid creations cavorting in glass beakers like some tiny detail in a Hieronymus Bosch painting as evidence of their chemical prowess (see also the menagerie of the campy Dr. Praetorius in the film "Bride of Frankenstein"). In science, early physiologists posited that each sperm contained within its head a very tiny yet well-formed homunculus, obviating the need for the mother's genetic influence and, apropos of that paternalistic era, making her essentially a simple vessel for the maturation of the wee nipper. Any resemblance of the mother to the child must, I suppose, have been shrugged off as coincidence. But I digress. Our hero Sebastian lives in a mental world all his own, derived from mythological and alchemical tradition and alternating between paranoid states and episodes of mental and physical abuse of the various women making up the furniture of the novel. As the story is set during the Cold War, Sebastian's experiments are closely monitored by operatives of both sides, broadly caricatured in the best Strangelovian style as psychopaths and sexual fetishists. Each wants Sebastian's secret in order to create armies of homunculi, although why that would be necessary, since each side already bristles with arsenals of nuclear weapons, is unclear. It is essential to the story that these same nuclear weapons have foolishly been left in the hands of ideologically fanatical perverts for use at their own discretion. Both sides have in mind the vaporization of Stockholm, rather than allow Sebastian's secret to fall into the wrong hands. I will cut the synopsis short in the unlikely even that you wish to search out a copy of this book for yourself. The book was passably enjoyable, but rather dated. I was perhaps too uninspired to puzzle out all the mythological/Jungian references, although the Sibyl who encounters Sebastian and the Prime Minister in the park was all too obvious. In the corpus of Delblanc's work, it does not seem to rank too high, so I wouldn't wish to pass judgement on the man based on this early work.